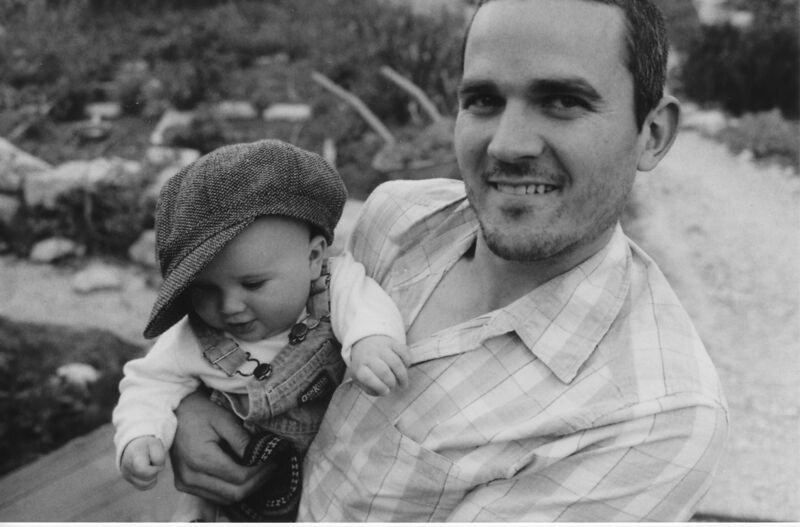 On September 23rd, 2011, Asher Palmer buckled his infant son Yonatan into the car and drove from Kiryat Arba heading to Jerusalem to meet his pregnant wife at her parents’ Jerusalem home, where they were to spend Shabbat. The twenty-five year old Israeli man was driving on Route 60 (a south-north intercity road in Israel that stretches from Beersheba to Nazareth) between the Jewish communities of Kiryat Arba and Karmei Tzur when several large rocks – thrown by Palestinians waiting nearby – crashed through their windshield, causing Asher to lose control and the car to overturn. Asher and Yonatan were pronounced dead at the scene. The police said that the front window was shattered and a large rock was found inside the car with Palmer’s blood on it. Two Palestinian citizens from Halhoul were arrested a couple of weeks later (by the Shin Bet) and admitted to throwing a rock that caused the fatal crash. The two were also investigated for the possibility that they were behind 17 other similar attempts to kill Israeli drivers. Remarkably, IDF figures revealed that the month during which the Palmers were attacked had been the most violent month in the previous year and a half in terms of rock throwing in the West Bank. There were a staggering 498 incidents of rocks being thrown at Israeli vehicles in September 2011 alone. 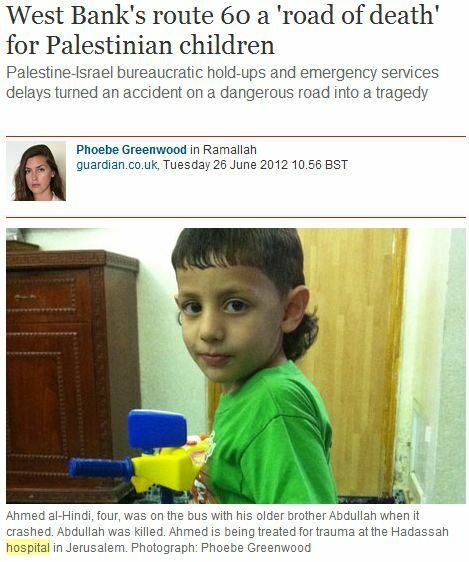 Phoebe Greenwood, who has been contributing to the Guardian from Israel and the Palestinian territories since January 2011 did not report the story. Here is the Guardian headline and photo in Sherwood’s story which mentioned the attack. A total of eighty-eight words in the Guardian have been devoted to the terror attack. There has been no mention of the names of the victims and no follow-up report on the arrest of the two Palestinians. A bus carrying children and their teachers from a kindergarten in Shuafat refugee camp (on an expedition to a park near Ramallah) was struck head-on by a truck travelling in the opposite direction, during a heavy rain, and forced off the road on a section of Route 60 ten minutes from Qalandiya . Nine children and the driver of the bus were killed in the crash. Thirty more children were injured. Several Palestinian children are still receiving care at Israeli hospitals for burns and post accident trauma. The exact sequence of events leading to the crash is not in doubt, though there is an investigation being conducted by the PA over what was perceived as the relatively slow emergency response to the accident. Characteristically, Greenwood has focused much of her writing on Israel’s perceived role in the accident. In The Telegraph, Greenwood cited a couple of hateful comments about the Palestinian victims, within one Israeli Facebook thread beneath a link to a story about the accident from the site of Walla, to contextualize the story, suggesting, evidently, that such views were indicative of Israeli sentiment. Greenwood fails to provide any context regarding Palestinian acts of terror (which prompted the construction both the security fence and checkpoints) which, since the Oslo Accords in 1993 through the 2nd Intifada, claimed nearly 1400 Israeli lives. But beyond such insinuations, much of Greenwood’s Guardian piece reads as simple human interest story and devotes quite a bit of space to the pain expressed by two Palestinian mothers – one who lost a five-year old so and another whose daughter is lying in a drug-induced coma at Hadassah Hospital in Jerusalem, after suffering burns to 75% of her body. There is, of course, nothing wrong with a reporter based in the region attempting to humanize and provide color to the often abstract contentious political issues involving the Israeli-Palestinian Conflict. Indeed, Greenwood’s empathy towards the Palestinian victims of February’s fatal bus accident was evident throughout her reports. However, in contrast, Asher’s wife Puah Palmer and his parents Moshe and Molly know precisely who is to blame for their devastating loss: two Palestinian terrorists who were intent on taking Israeli lives and apparently unmoved by the possibility that the act of terror they were committing could take the life of a baby. Has Greenwood ever considered talking to the surviving family and friends of Asher and Yonatan Palmer in Kiryat Arba – to give voice to their pain, grief and anger? It is really difficult to read the Guardian each day, observing its egregious lack of empathy towards Israeli victims of terror and its continuing sins of omission regarding the Palestinian perpetrators without coming to the conclusion that, at the paper, Israeli Jewish life is cheap and the lives of “settlers'” even cheaper. I wonder why Adam has no room to mention the very sympathetic coverage of the Munich massacre in today’s Guardian – by Harriet Sherwood no less. The piece is based around an extensive interview with the widow of one of the victims who is campaigning for an “official moment of remembrance” during the London Olympics. 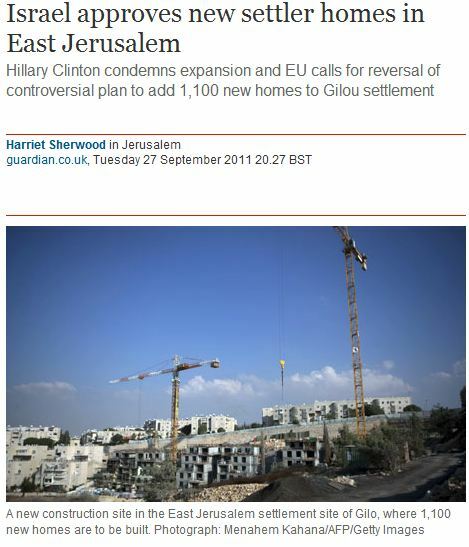 Could it be that the story might conflict with the CifWatch charicature of Sherwood and The Guardian as anti-semitic? Sorry, ‘charicature’ should read ‘caricature’. I’ve noticed that one or two CifWatchers like to scoff at my spelling errors. Projection old bean, it’s you what does the scoffing. So, one sympathetic piece should cancel out all the other hostile, biased, and sometimes even false reports? Why does Adam need to mention one sympathetic Guardian item in his post which deals with quite another incident? 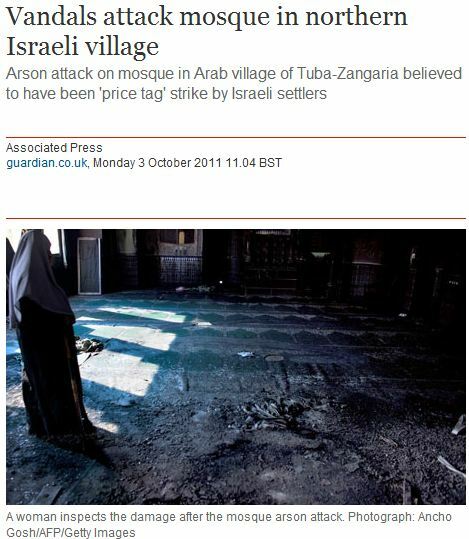 How many other sympathetic to Israel articles can you find in the Guardian? Then compare and contrast to the number of hostile pieces. Thanks for pointing this article out. It was a moving read, and I’m glad Sherwood wrote it. She even called it a “terrorist” attack (which is I believe contrary to the Guardian’s style guide)! As Anne points out below, however, it is a mere babystep in the right direction for Harriet, and as Doug points out, there are still one or two little digs in there. However, I don’t wish to be churlish. I for one, congratulate Harriet on the Munich article. I pray that there will never again be any need to write sympathy pieces about any victims of terror (or accident), but in the probable event that these horrors do happen in the future, I hope she (and the MSM in general) is more balanced and nuanced than in the past. I wonder why M. Levick forgot to mention that settlers also throw stones on Palestinian vehicles and even on IDF vehicles. Palestinian civilians and Israeli soldiers have been injured by rocks thrown by settlers. Why not write a story on this too? WHAT CIF WATCH WON’T PUBLISH: settlers throwing stones at Palestinian civilians and Israeli soldiers. Sencar, the answer is easy. The Guardian is a newspaper whose journalists report on the news with impartiality. CIF Watch is a political website which publishes comments that can further its political agenda. Nat – your hypocricy is astonishing, but I offer you congratulations. You have managed to answer in this post the question you raise in your next post asking why Cif Watch is unlikely to publish a story irrelevant to this site’s agenda. By the way I do not accept that Guardian journalists report the news with impartiality, neither are they under any duty to do so. They do, however, have a duty to report the news with appropriate context and with at least some effort to establish whether what they are printing is in fact true. Sadly, these are duties that Sherwood and her stablemates clearly fail to meet time and time again, hence the existence of this “political website” which seeks to hold such failures to account. What Mr Levick forgot to mention in this story is that all Israeli settlements in the West Bank, including those located along Road 60, were built in violation of intentational law in the occupied Palestinian territory. What Nat forgot to mention is how, even if what he says is true, this justifies in any way whatsoever the violent murder of a man and his infant son driving to visit his family. Gooner, why does CIF Watch report on Palestinian throwing stones but not on Israeli settler throwing stones? Nothing can justify the murder of a child, ever. It’s difficult to understand why people move to settlements outside Israel, where they’re not safe and in breach of internatinal law, when theyre are so many great places in Israel when you can safely live with your family. Greenwood’s article on the accident which took place on road 60 is a masterpiece which should be showed in journalism schools as an example of high-class journalism. CIf watch’s post criticizing this story is pitiful. Adam, this is a really superb piece — your careful presentation of the articles does an outstanding job of showing the massive double standard in Greenwood’s work. As often, CIF Watch ends up attacking a woman journalist who’s successful in her work. Jealousy, jealousy. As so often, Nat ends up bringing up totally irrelevant, fantastical allegations because he can’t address the actual point made in the article. Idiocy, idiocy. Women work and can be successful in their career. Get over it. The groaniad and the bbc will occasionally produce a pro Israel piece.They can they then point to it as evidence that they are not biased. Even one of their senior staff admitted this was untrue. Who was this senior staff? Are you sure he was not the one who was partial? As usual, you write, you write bu when asked to back up your claims with evidence you prefer to disappear. This Guardian’s story is high class journalism. The poor intellectual level of critics trying to pretend the contrary is almost amusing.